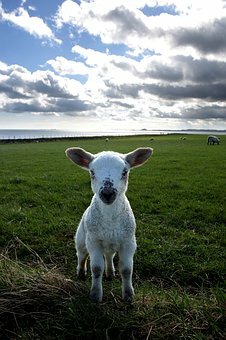 Refreshing Daily in God's Word: Daily Devotion: Where Is the Lamb? Key Verse: Verse 7 - “And Isaac spake unto Abraham his father, and said, My father: and he said, Here am I, my son. And he said, Behold the fire and the wood: but where is the lamb for a burnt offering?" We know Isaac asked the question, “Where is the lamb?” Abraham’s answer is not only one of faith; it is also prophetic. God will provide Himself a lamb. And He did---Jesus Christ. The biggest bulldozer in the world is the D575A. It’s 16 feet long, 25 feet wide, and 41 feet high. It weighs 225,000 pounds. It’s a huge machine to bulldoze dirt. A couple of years ago, it came to a county where there was an overload of garbage, and the bulldozer was brought in to dig a big hole that would collect the garbage and remove it from the lives of the citizens. ✞ Have you been to Jesus for the cleansing power? Are you washed in the blood of the Lamb?